The Spanish economy continues to crumble. Total unemployment in the country is now hovering at 22%, and unemployment for people age 18 - 35 is now over 45%. The youth, after spending tens of thousands of dollars on a college education, have no job opportunities available for them. In order to pass the time during the day they have begun forming protests which continue to become more and more violent. And more form Spain and a glimpse into the coming American lifestyle when our bankrupt government no longer can provide endless weeks of unemployment, social security, medicare, stimulus programs, $150,000 government salaries, and monstrous government pension programs. Interesting video below discussing some of the history involved in the silver market. It focuses on the Hunt Brother's attempt to corner the silver market to send prices higher back in 1980, and then discusses Barclay's and JP Morgan's attempt to manipulate the silver market downward today. It is worth noting that the entire above ground supply of silver today would be about $35 billion to purchase. That is a flick of dust in relation to the global markets. A buyer will wake up one morning, similar to the Hunt Brothers did in 1980 and Warren Buffett did in 1997, and decide they want to remove all remaining supply. Mark Haines, a CNBC legend, passed away this morning. The following was his teary goodbye to Erin Burnett, who just left CNBC to work with CNN a few weeks ago. They worked together for years on Squawk on the Street and they both felt like family to me due to the amount of time I've spent watching this network over the past 6 years. We will miss you Mark. Chart below shows the pain. Moody's reported this week that commercial real estate prices fell 4.2 percent month over month in March and are now down 8.5 percent from one year ago. 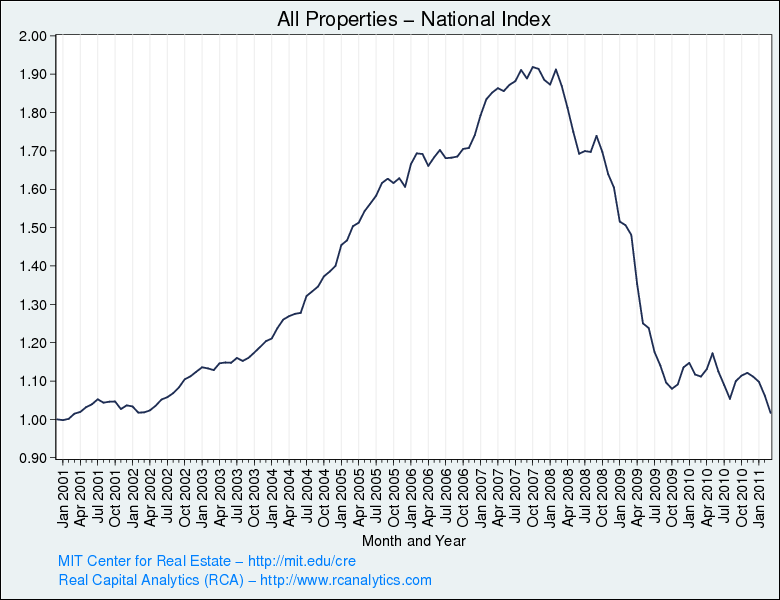 Prices have fallen 47% from the peak of the bubble and have now reached a new post bubble low. 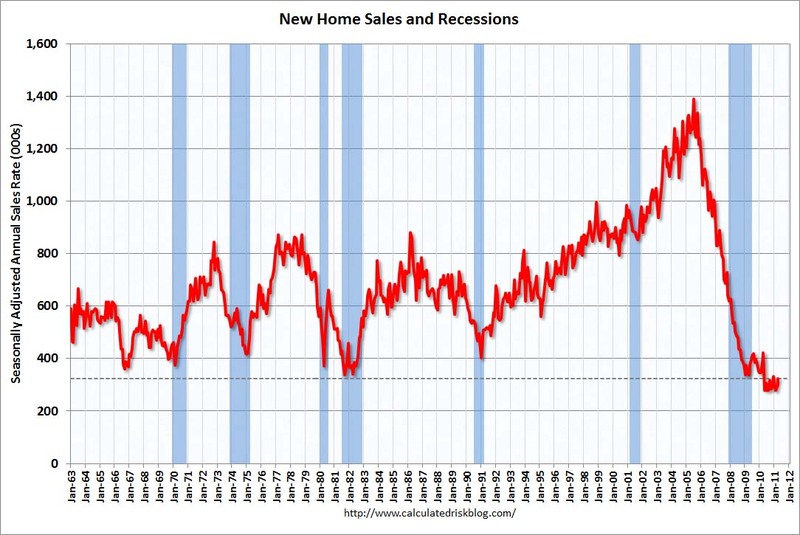 The chart below shows the continued destruction. 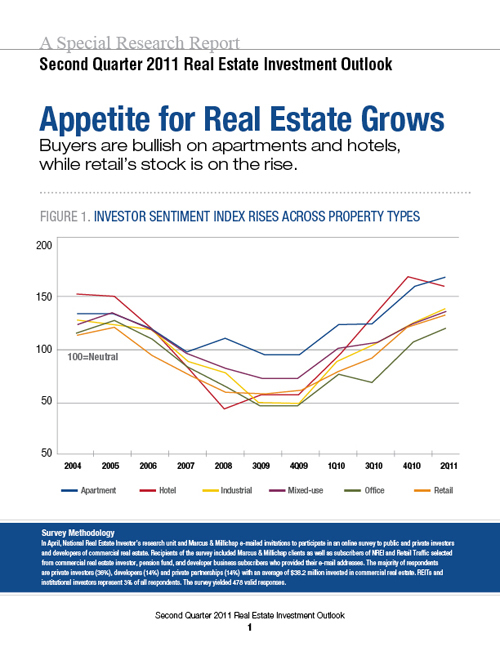 The most fascinating part of the commercial real estate market is that as the fundamentals continue to grow darker and prices continue to fall, investor sentiment continues to rise month after month. The chart below is the most recent poll from Marcus and Millichap which shows investor sentiment rising from 154 in the fourth quarter of 2010 to 164 in the second quarter of this year. Every sector reported a marked improvement in investor sentiment! 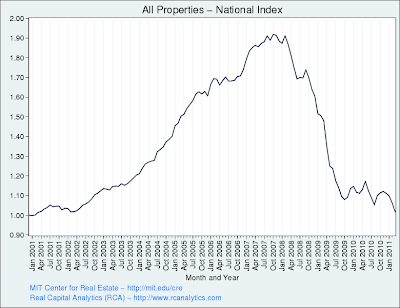 When interest rates rise on the ten year treasury, which are currently priced at bubblicious levels, it will simultaneously push cap rates higher on commercial real estate. This will shock the investors that are pouring into the market today who will be slaughtered during the next leg down of our economic collapse. There was an interesting article in the New York Times this weekend titled Gold Is Not An Investment. The author argues because there is no true way to value gold it is purely a speculation. He is exactly right. Gold has no earnings, no board of directors, and it pays no dividends. It is a lump of metal. Its value is only based on the demand in the free market, which makes it terribly difficult to determine a "fair" price for gold. My view is that gold is money. 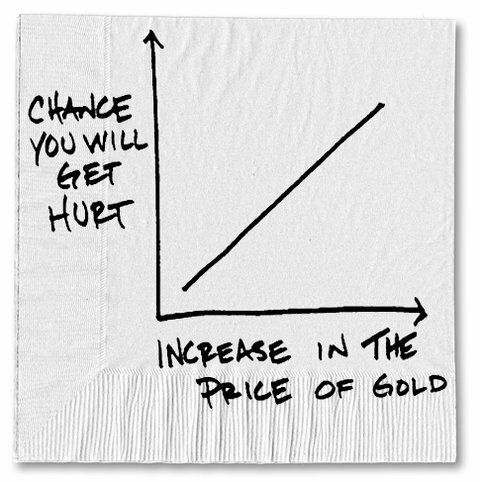 The price of gold reflects the market's view of the current value of the paper dollars you are purchasing it with. American dollars, and all paper currencies around the world, have no tangible value. In 1971, when president Nixon removed the world from the gold standard, governments were then able to print any quantity of money they desired. This simultaneously allowed them to spend and run any size deficit they desired. The reason a paper dollar has no value is there is no scarcity. There is an unlimited amount of currency that can (and will) be created just by pressing a few strokes on a keyboard. It is now all done electronically. Gold has scarcity. To extract an ounce of gold from the earth it takes years of time and labor to develop a producing mine. The author did include a simple graph in his article, and I agree with it completely. The higher the price of gold, the more dangerous it becomes to buy in. This will be very important when we reach the mania stage of this secular bull market. David Stockman discusses the coming United States debt default. When the people of Belarus went to sleep last night, most probably assumed that the following Monday would be just like any other when they woke up in the morning. Reading the morning news they found out that something was different. Overnight, their currency had been devalued by 56% percent. Those holding assets denominated in Belarus currency (stocks, bonds, cash) were now 56% poorer. Those that went to sleep holding assets not denominated in Belarus currency (gold, silver, foreign currencies) woke up much, much richer. They can now go to the grocery store, the gas station, or the mall and purchase far more items than their neighbors. Someone went to sleep in Belarus last night thinking they would put some of their hard earned savings into precious metals. This is the equivalent of having fire, life, or auto insurance in a paper backed financial world. Then they woke up and it was too late. One night, it could be tonight, or it could be 5 years from now, there will be a run on American dollars. Most likely the panic will start in the Asian markets (that trade during the hours we sleep) and Americans that went to sleep without insurance will wake up devastated.